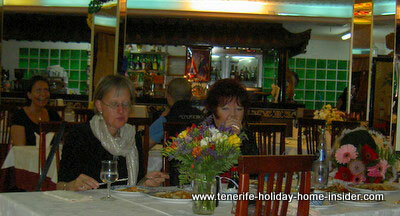 A birthday party with Thai food at a the Ruen Thai an utmost luxury for celebrations. 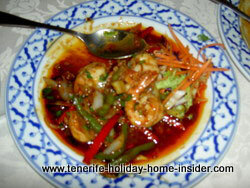 Thai food was the highlight of our birthday party around Easter 2011 at the Ruen Thai Restaurant in Puerto de la Cruz. Ever since, we've come back twice a year to celebrate birthdays at the Ruen Thai. 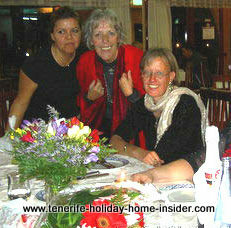 We had our party at the Restaurant Ruen Thai in Tenerife North, a photo of which shows some of us. Find this Asian restaurant in Calle Dr. Celestino Cobiella Zaera outside the bottom section of the resort hotel Puerto Palace which is a town hotel of Puerto de la Cruz. The Spanish looking lady depicted beside me in the background was one of our lovely waitresses. This birthday celebration or fiesta de Cumpleaños, as translated in Spanish, had to be postponed for one day. A very large group had booked our special day for a big event already by telephone. One of our special guests was a young lady from Cologne who had never eaten Thai food but who was fond of a spicy cuisine. Green beans, sweet corn and green pepper peaces with little onion as well as mushrooms may feature in Thai vegetable curry, while shrimps may be used as paste for fish. However, grilled fish is also much loved with Thai dishes, while little coriander or even Basil may ad flavor together with a coconut sauce. Ginger is a standard curry paste ingredient with some fish sauce. Of course, Cardamon and Tamarind have their place in the Thai kitchen besides common garlic and onions. Lemon grass and lemon leaves together with coconut in some form are ideally eaten with Thai food of subtle sweetness. Then there's the coconut which lends its milk, its butter as well as its roughage for sauces, soups and main meals. In the past, Almonds featured more in some Thai recipes besides peanuts and fruit. Green and fresh red hot chilly peppers dominate as spice ingredients. Even cross pollinated chilly, as depicted beside does well. Herb hybrids are a wonder of nature, above all with chillies, while their flavor may be much more subtle, at times. Using lots of a less spicy variety, instead of one hot one is worthwhile experimenting with. Otherwise, use also fresh Thai herbs for preparing food, some of which are not found in Tenerife but, grown by this Thai restaurant of the north. And then there are the Thai glass noodles as well as rice noodles. Soy bean sprouts are as widely spread with Thai and Asian cuisine as common rice. However, soy bean sprouts are not available on all markets outside Thailand. Again, an option is to grow your own. It is easy or to buy the sprouts imported, which may be in tins, though. 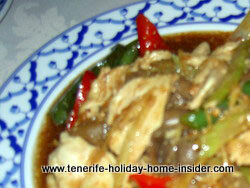 One of our favorite dishes at the Puerto Cruz Ruen Thai is red chicken curry with some green pepper bits thrown in. A hint of ginger may ad flavor to hot chillies besides lemmon grass. 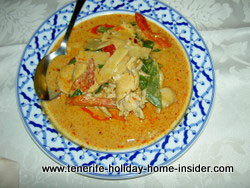 I also like yellow and green curries, while there is a good red one with vegetables at the Ruen Thai Restaurant. Also good is Beef Massaman Curry for those who don't mind red meats. By the way, I have never come across rabbit with Thai food. However, I wouldn't be surprised about non poisonous snakes being used with Thai recipes by expert country cooks. Of course, the latter also know the rarest tropical forest mushrooms, some of which may be on the bitter side, though. 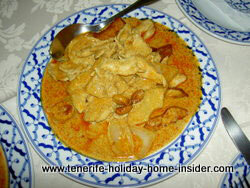 The Massaman chicken curry was in a coconut sauce with whole peaces of pine apples and peanuts added. The chicken bits were lovely and tender, as they may have been marinated beforehand. This chicken dish is a nice alternative to the red Massaman, which I prefer, however. 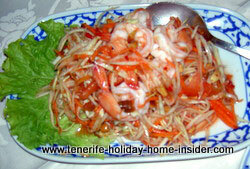 The Thai Papaya salad portrayed beside had carrots, with some spicy orange flavor as well as the Papaya fruit. I am not sure, how its hotness was achieved. This is a must of course. Perhaps Tamarind and Chilly in some form did the trick. The hot shrimp garlic salad was even more applauded by all of our birthday party guests. This is what Thai food is all about. It's got to have that bite which melts on the tong with the sensations of Oriental culinary delights. Only Thai dancing with typical music could have improved our birthday celebration. Travel to Thailand and to Bangkok to enjoy Thai cuisine and rich Thai customs... There, traditional dresses with Thai jewelry and fantastic head gear are the order of the day for many Thai celebrations. 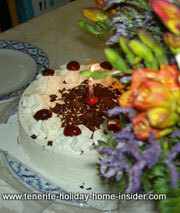 Spot our genuine Black Forest cake called Cake Selva Negra or Tarta Selva Negra in Spanish..., which our birthday host had bought for about €7 or 8 at the 'Sumo Supermercado 2000 Spar' now called Coviran of Puerto Cruz La Paz. It was delicious and even had a hint of real 'Kirschwasser' (strong high alcohol Cherry liquor) inside. No, the Thai restaurant didn't mind that we brought a cake to eat there. Also, guess that their staff didn't mind a taste of it. dishes and starters and never manage desert, except for the above cake. From Thai food back to restaurant Ruen Thai where you may discover a photo of one of our birthday party starters called Kratong Thong which is utterly delicious.